Maybe your training regimen doesn’t taper off with the sunlight, or your campsite is another mile away, or you just need to respond to nature’s call in the middle of the night—and in the middle of nature. We rounded up 12 of the best ways to shine a light on the outdoors when the moon doesn’t suffice. 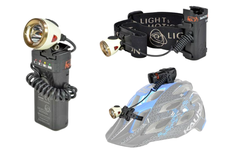 These rough and ready options are evenly divided between headlamps and durable, trail-ready flashlights. Click here to see 12 lights for your outdoor adventures. Headlamps are a great option for backpackers and hikers who need their hands at the ready—try holding an open map and shining a flashlight on it at the same time. And, in case you’re wondering, these are generations of technology removed from those headlight contraptions you used to see affixed to miners’ hats in the movies. Two of the headlamps on our list actually detect where you’re looking and adjust the beam’s direction and brightness. But if a reliable flashlight is more what you’re after, we picked some of the most durable on the market. One is a favorite of law enforcement and another can be dropped into as much as three feet of water without being any worse for the wear. Some things we looked for: brightness, weight, battery life, whether a light is waterproof and, of course, price. Because all of these lights are good for different purposes—some are ultra-light while others are ultra-bright, and one, in particular, is ultra-versatile—we ranked them by bang for your buck. Check out the whole list and see what works for you.